Bonds breaks the record, but for how long? After all the hype, all the pressure, and all the steroids, Barry Bonds finally surpassed Hank Aaron as the all-time home run leader in Major League Baseball. On Wednesday night, as the Giants squared off against the Washington Nationals, Bonds stepped up to the plate in the fifth inning. 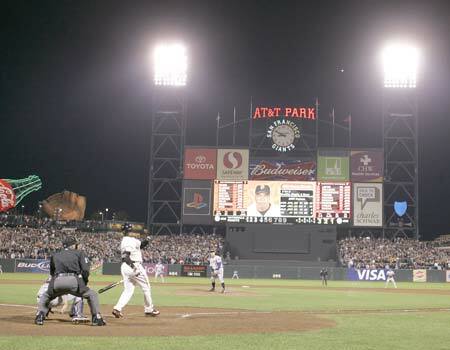 With the count loaded at 3-2 he hit the payoff pitch and swung his way into history, if not infamy at the same time, sending a shot deep into right center field at AT&T Park in San Francisco. He was met at the plate by his godfather Willie Mays while a pile up ensued in the stands over the ball. The game was stopped for 10 min of fireworks and ceremony before the Giants went on to lose the game. So Bonds will likely hit a few more home runs this season, finishing perhaps with 760-765 for the new bench mark. But how long will Bonds be able to remain the home run king? Many fans, including commissioner Bud Selig and Hank Aaron himself, are already looking forward to the day when Bonds is dethroned. And who is the likely successor? All signs point to Alex Rodriguez, otherwise known as “A-Rod,” currently of the New York Yankees. The Mighty A-Rod recently hit his 500th home run at the age of 31, in his 14th major league season. Compare this to Bonds, who hit just 445 home runs in his first 14 seasons. To date A-Rod is averaging 36 dingers a season to Bonds 34. 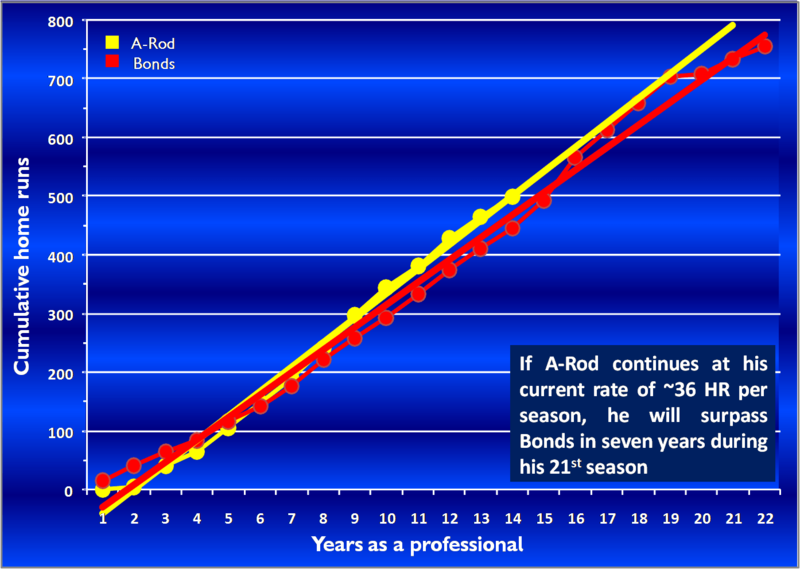 This average together with his faster pace to 500 predict A-Rod will surpass Bonds in approximately seven years when he is 38 and in his 21st major league season (Figure 1). 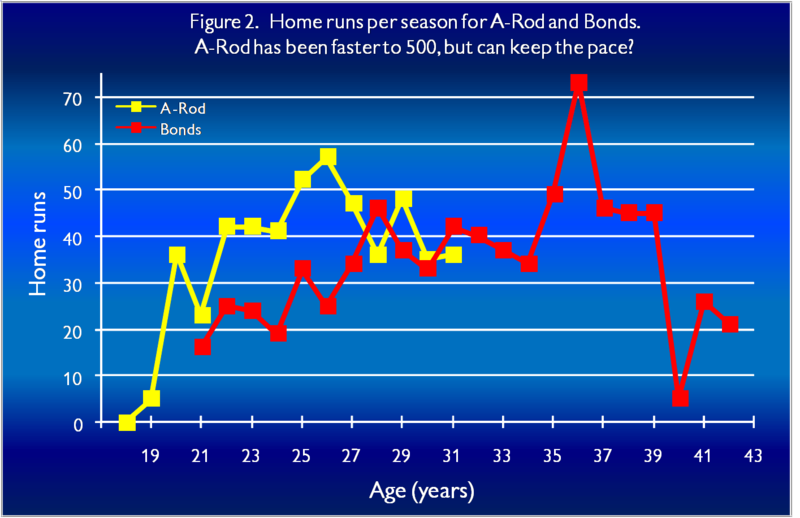 While entirely possible, this is actually a big ask as it means A-Rod must average close to 36 home runs a season between now and then, and furthermore he appears to have had his peak home run season five years ago in 2002 when he was 26 and hit 57 home runs (Figure 2). It also means he must keep playing well past 20 major league seasons, and while there are a number of players who have not only done this but gone on to seal their place in the Hall of Fame after 20+ years, this is a long career and A-Rod (or any player) might find it challenging to keep the competitive fire burning for another 7-8 years. In addition he must remain healthy enough to keep his up output. For now Bonds takes the spotlight and shares it with no one. The Commissioner of baseball was not even there to witness the record, instead sending a vice president to stand in. However Hank Aaron, who recently has shunned Bonds, pre-recorded a video that was played during the celebratory game stoppage. In it he expressed hope that Bonds breaking this momentous record would inspire many others to chase their own dreams. Keep chasing, A-Rod. . .keep chasing. . .